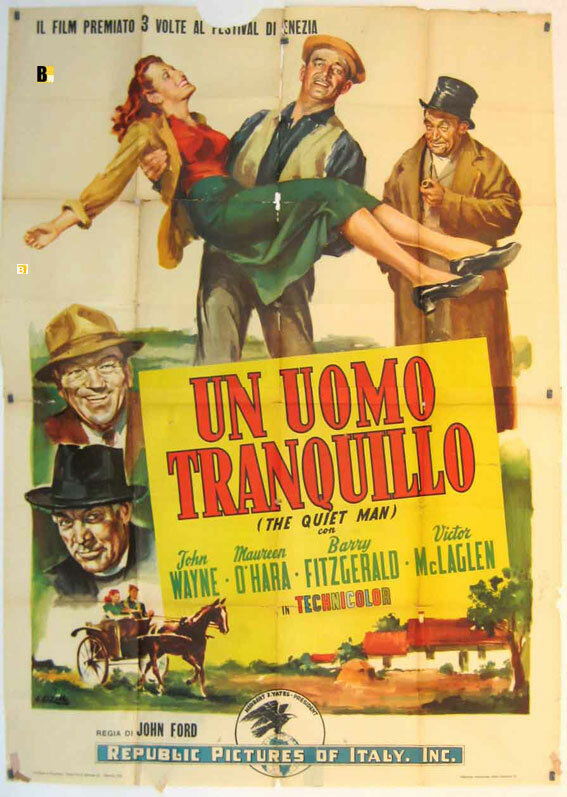 THE QUIET MAN (1952) –Olive Films Signature Series Blu Ray $39.95 Color 129 minutes. Region 1. 1.37:1 mono release date October 25,2016 . 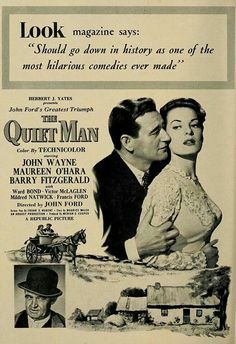 One of the most beloved films of all time gets a wonderful and superlative release from OLIVE FILMS as part of their inaugural ‘Signature “releases (along with HIGH NOON, covered previously( https://scarletthefilmmagazine.wordpress.com/2016/09/26/high-noon-olive-films-blu-ray-and-dvd-signature-release/ ) and the quality and respect that these masterpieces have received from the studio should make movie lovers rejoice. Coming from the original camera negative, the transfer received a 4 K scan and the results are amazing. 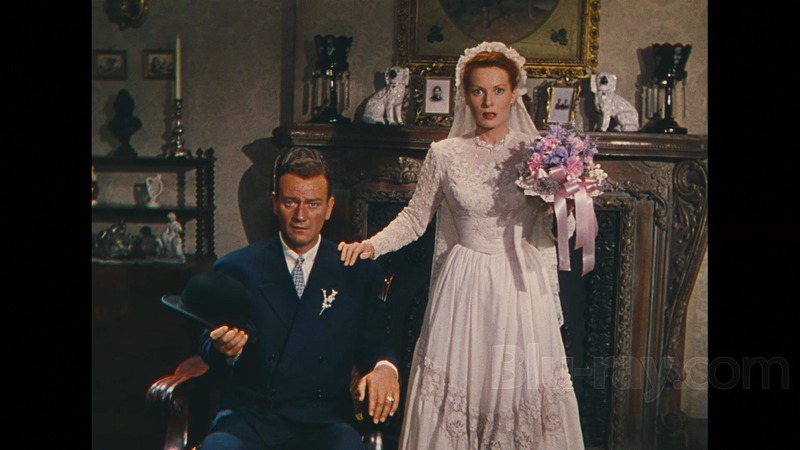 The Technicolor no longer has that slightly muddy look that the film had for many years. 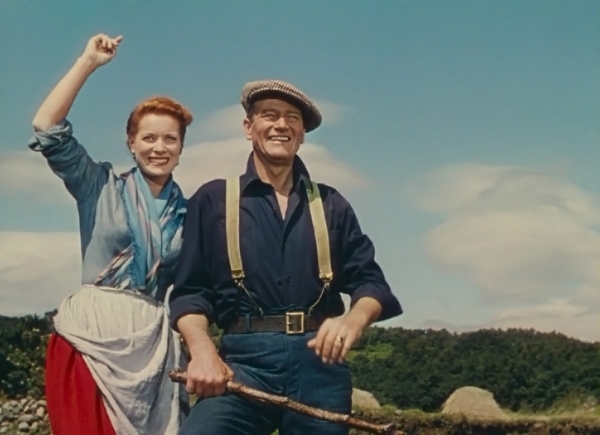 Maureen O’Hara ‘s fiery red hair blazes with the passion that also illuminates her performance. The greens fields make you want to pack your bag and ‘teacht ar ais go hÉirinn” (“come back to Ireland”). 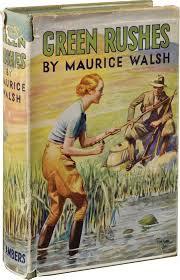 The story by Maurice Walsh first appeared in the February 11,1933 edition of the Saturday Evening Post, and was later published in a collection called The Green Rushes (1935, Frederick A. Stokes Co.) . John Ford ‘s love of the story involved him having to first do a western for Republic (RIO GRANDE 1950). 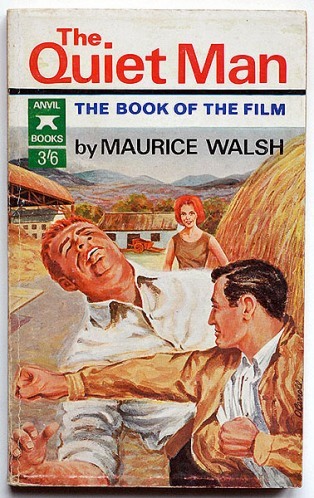 That film was successful enough that the studio approved location filming in County Mayo and County Galway while shooting in the more expensive Technicolor (most of their color films were shot in the cheaper Tru Color Process). Then interiors were shot back at the studios in Hollywood. American Sean Thornton (Shawn Kelvin in the original story), played to perfection by John Wayne, returns to his ancestral home in Inisfree. 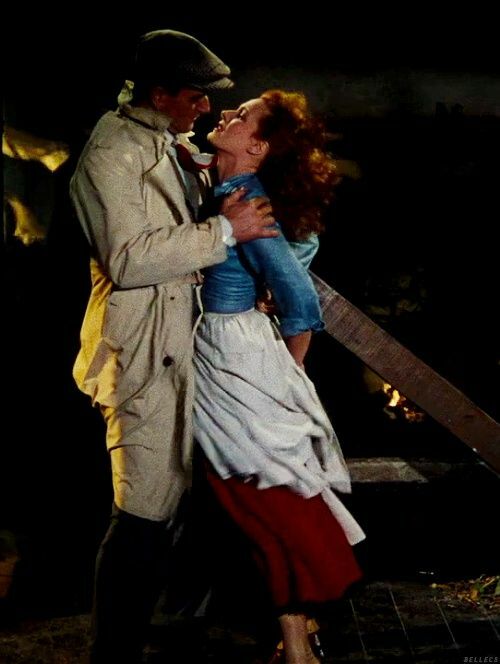 He begins to fall for the beautiful colleen, Mary Kate Danaher (Maureen O’Hara), but she wishes to observe the local matchmaking principals, and obstacles and cultural differences keep getting in the way. 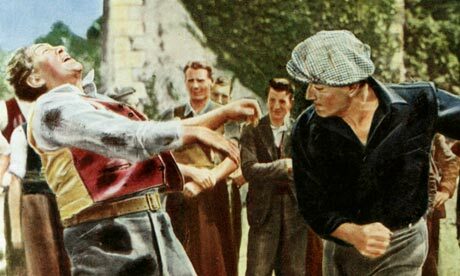 Also, a huge block is her brutish protective brother, Squire ‘Red “Will Danaher (Victor McLaglen, Oscar winner in 1935 for RKO’s John Ford classic THE INFORMER, wherein he played another slow witted but brutish fellow during the Irish Revolution). He cannot stop the couple from falling in love but he can deny them her dowry. Instead, the Squire challenges Thornton to fight, but the Yank walks away. Mary Kate thinks that Sean is a coward, but as the film unfolds we find out he has a dark secret. The film ends with one of the best and most exciting and funny fight scenes ever committed to celluloid. 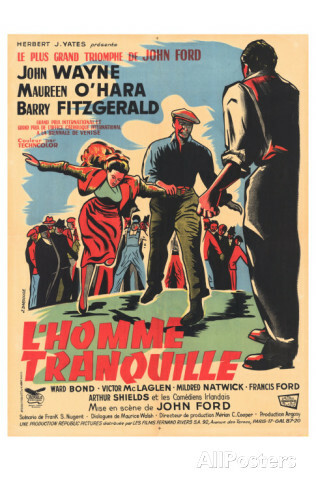 Onto this slim framework, John Ford (via a screenplay adaptation by Frank S. Nugent, who wrote some of Ford’s best films) populates the film with almost every Irish character actor from Hollywood as well as several locals. 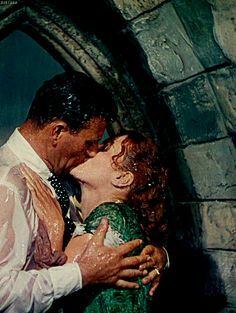 The film makes the countryside also as much a character, and when the storms and rains hit, we are treated to one of the most electric screen kisses of all time. 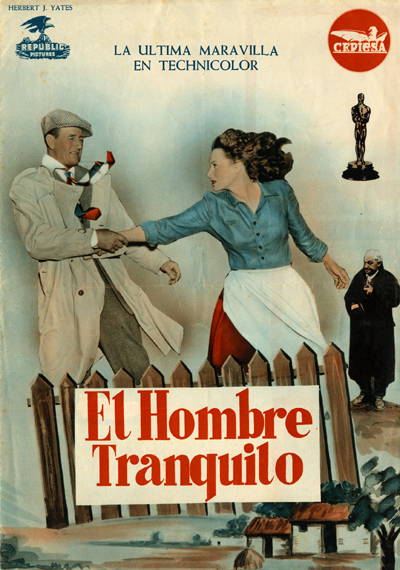 In 2013, OLIVE FILMS released the film on BLU RAY and DVD. While the film has hardly been out of the public eye since its release (a yearly March must show on television, as well as various releases on VHS by Republic as well as DVD releases by Artisan), the current incarnation from OLIVE FILMS is the must own version. As mentioned, the film has been given a beautiful video upgrade. I do not have the previous Olive Films release for comparison, but must reiterate that this print is flawless. Colors leap out and the mono sound is ultra clean and hiss free. The English optional subtitles follow the action and dialogue precisely. Kudos to whomever is charged with this important option for the hard of hearing audiences. 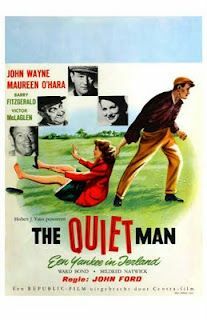 The Making of The Quiet Man – a documentary that originated in the 2002 Artisan release. Leonard Maltin as always guides us through the history of this classic film in his usual fun and informative style. 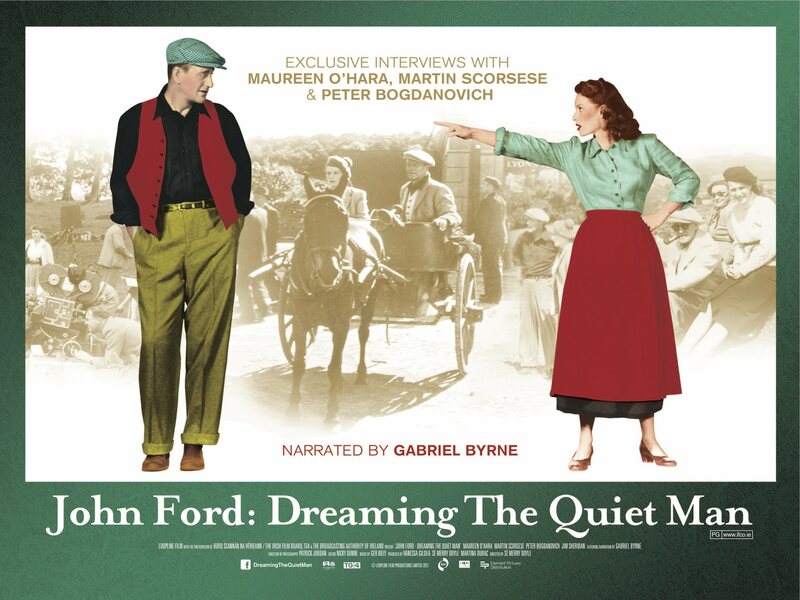 Audio Commentary Track by Joseph McBride, author of two John Ford books. 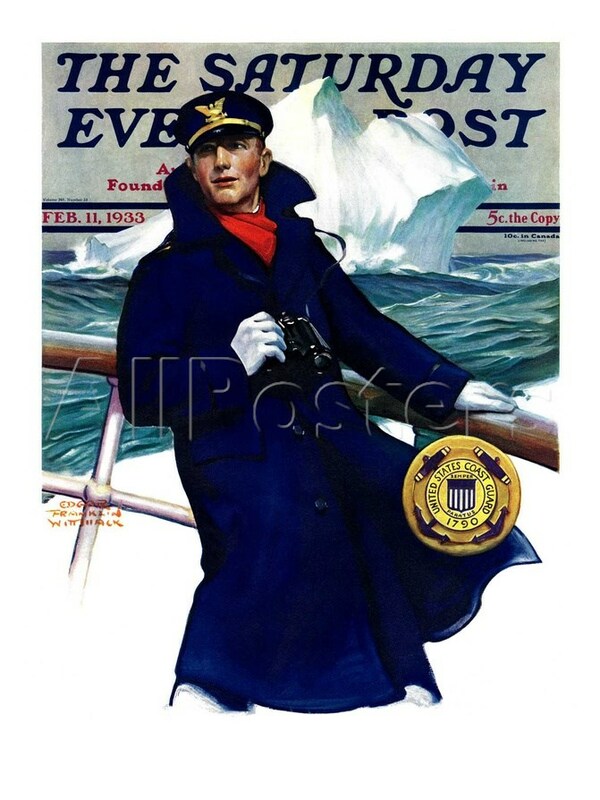 The love of his subject comes throughout his feature, dropping facts and info in an easy and informative fashion. It is so informative about the film and Ireland in 1951 that this is a track you will want to listen to it several times to get the full effect. Free Republic – a brief little history of the studio as to how a film processing company got into producing no nonsense and profitable films but somehow made films like Orson Welles’ MACBETH (1948, coming from Olive Films on Blu Ray http://www.olivefilms.com/films/macbeth-%E2%80%93-olive-signature/ ) and of course THE QUIET MAN. This short is hosted by by Marc Wanamaker, a co-author (along with E.J. Stephens) of EARLY POVERTY ROW STUDIOS (Arcadia Publishing,2014). Mr. Wanamaker is also a founder of the Hollywood Heritage Museum. A Tribute to Maureen O’Hara – actresses Juliet Mills, Hayley Mills, and Ally Sheedy share their memories and tributes to the actress. Besides her beauty, they make sure that people are aware of her strong personality, her charm, her career, her grace, and most of all her great talent. The warmth of their memories is truly moving. The Old Man- Director Peter Bogdanovich (TARGETS, Paramount,1968) shares his thoughts on Ford and his career. From interviewing Ford for Esquire, the two directors developed a lasting friendship. I enjoyed Bogdanovich’s story of visiting Ford just before his death, along with Director Howard Hawks, and instead of hello Ford barked out how could Hawks stand all the questions that Bogdanovich’s had! The booklet enclosed has a few photos but no real information besides the cast listing, chapter stops on the disc and listing of the extras. The slipcover can be reversed to show a beautiful black and white photo of the courting ride through town. 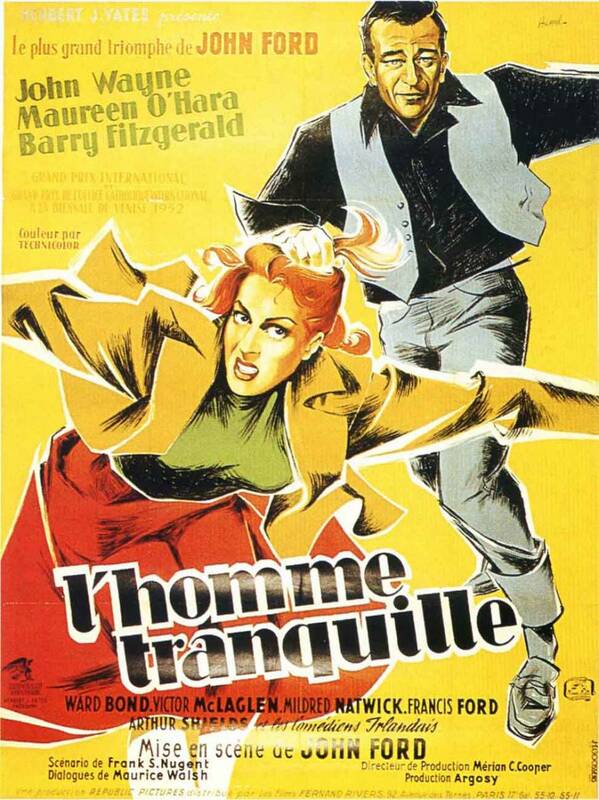 The cover is a shot of the same sequence, with the two lovers walking in front of the carriage driven by Barry Fitzgerald. That shot captures the beauty and the romance of the film, and kudos for this original choice. It is also used for the hardcover cardboard case that it comes in. 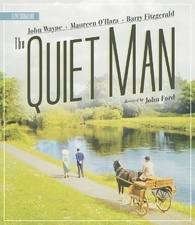 The only way that I could see this release being any better is if they had also added a second disc to include the 2010 documentary DREAMING THE QUIET MAN (available from OLIVE FILMS http://www.olivefilms.com/films/john-ford-dreaming-the-quiet-man-blu-ray/ ) . I could go on and on as to why this film deserved to be chosen by the U.S. National Film Registry by the Library of Congress in 2013, but if you have ever seen the film you have no need for convincing.